Join landscape architect Matt Whitaker to learn the art and science of pruning. Matt has been pruning since the age of 10 when he decided to “clean-up” the yard. Since that fateful day, he has spent three decades studying plants and practicing the art of pruning everything from azaleas to raspberries. Matt practiced landscape architecture in Virginia for 9 years where he studied under world-renown fruit expert Tom Burford. Matt’s fruit pruning chapter started when Tom consulted on a 60 tree orchard where they pruned/trained the orchard from year 1 to 4. This will be a hands-on pruning workshop. The first hour of the workshop will involve classroom instruction. We will then move outside for practical pruning instruction. Topics covered will include: an overview of plant anatomy and physiology, different pruning cuts and plant response to the cuts, and differing approaches for differing plants. The workshop will focus on fruiting trees and shrubs, however, the techniques learn are applicable to all plants. Various ornamental shrubs and trees will be covered as time allows. No prior pruning experience is necessary. We welcome all skill levels. Please dress for the weather, including warm boots and gloves! Bring rain gear if it is damp. We will be outside except in pouring rain. 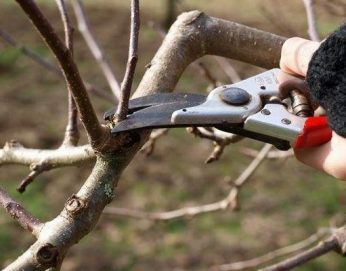 ​Participants should bring sharp and clean pruners, loppers, or small hand saws if you have them. Crabtree Farms will have a limited number of tools available to loan for the class. Please let Crabtree know the week before the workshop if you would like instruction on purchasing tools. ​You are welcome to bring lunch or Crabtree can provide a lunch from Neidlov’s Breadworks for an additional $13. Lunch from Neidlov’s will include a sandwich (meat or vegetarian), chips, and water. If you are purchasing lunch via our Niedlov’s option, you must do so by February 25th! Email Melissa at [email protected] to find out your sandwich options. Space in this workshop is limited to 35 people. Non-Members $45; Members $40. Lunch $13 (optional).